Online Renting – OpenTech Alliance, Inc.
What’s that? You’re not renting units online? Renting your units online is a no-brainer. But first you have to make it easier for the online community to do business with you. 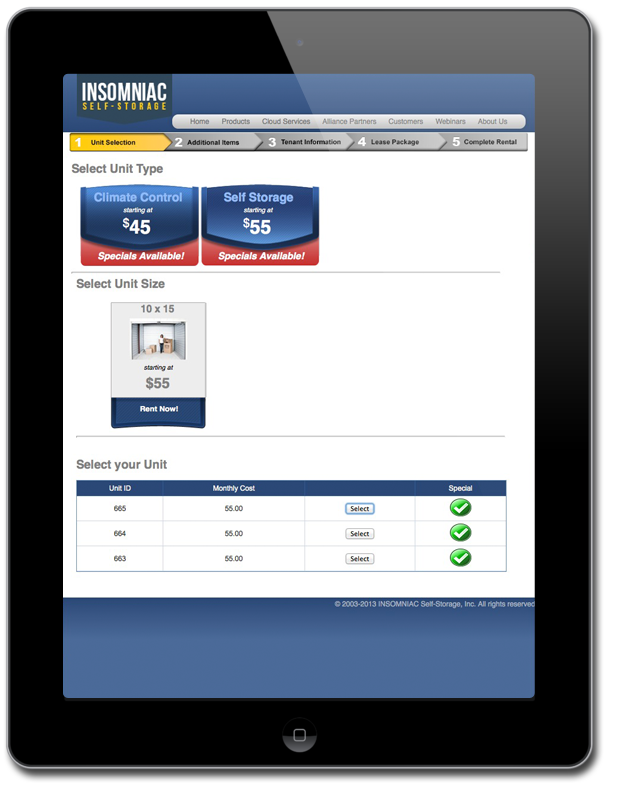 With INSOMNIAC Online,™ your website customers can select their unit, sign the lease and pay for their space before even calling or visiting your office. All the paperwork is completed in advance from the convenience of a desktop computer, tablet or smartphone. And the best part is… you only pay if the customer rents. Self-storage companies that leverage our cloud-based rental platform improve customer convenience while increasing monthly sales. By renting units online 24/7, you reach a larger pool of prospective customers—many of whom you can take off the market immediately and turn into tenants. INSOMNIAC Online is safe for shoppers, as it uses the same security platform as the leading financial institutions. Drop us a note, give us a call (800.481.7459) or watch our online demonstration here.